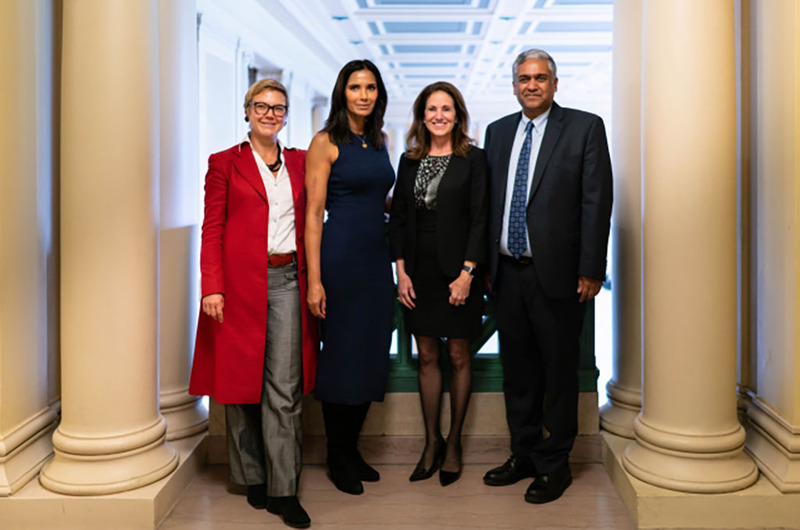 Last week Padma Lakshmi launched her appointment as a visiting scholar in the Center for Gynepathology Research by immersing herself in MIT labs and classrooms before delivering an evening talk. “I went around and tried to learn as much as I could from people who are doing amazing and beautiful things. I know what I’ve learned will inform my work in the future,” she told a packed auditorium at MIT’s Open Endoscopy Forum, which features TED-style talks from leading gynecology surgeons and MIT technology pioneers. Lakshmi is the host and executive producer of Bravo’s Top Chef; she’s also an author, an actress, a spokesperson for the American Civil Liberties Union, co-founder of the Endometriosis Foundation of America, and a vocal activist in the realm of women’s health. When MIT launched the Center for Gynepathology Research in 2009, she delivered the keynote address. Since then, Lakshmi has returned to MIT on multiple occasions to discuss women’s health issues and raise awareness about endometriosis among MIT students. “I never expected to be holding a microphone at MIT,” said Lakshmi, who was hosted by a leading expert in endometriosis, Linda Griffith, an MIT School of Engineering Professor of Teaching Innovation, Biological Engineering, and Mechanical Engineering. Earlier in the day, Lakshmi met with MIT Chancellor Cynthia Barnhart and dean of engineering Anantha Chandrakasan, the Vannevar Bush Professor in the Department of Electrical Engineering and Computer Science. Lakshmi also visited with research scientists to discuss new developments in the diagnosis and treatment of gynecology diseases, including endometriosis, adenomyosis, and preterm birth. She toured the MIT Center for Microbiome Informatics and Therapeutics to learn more about MIT’s work studying and controlling the gut microbiome.